"Feeding silage is much different than feeding hay," notes Dennis Hancock, extension forage specialist for the University of Georgia. "Because it's wetter, deterioration becomes a factor when silage bales are opened and exposed to oxygen in the air." The Georgia specialist uses a potato salad analogy in the most recent edition of his Grass electronic newsletter. He explains that precooked and prepared potato salad doesn’t need to sit out very long before quality rapidly deteriorates, especially at a summer picnic on a hot day. The same thing can occur in the winter, though spoilage may take longer to occur. Either way, long-standing potato salad is a risk to ingest and digest. "Never leave silage exposed to the air more than two days during feeding," suggests Hancock. "If the daytime temperature exceeds 60°F, don’t leave it exposed more than one day." He explains that these guidelines are especially important for farmers feeding baled silage. If using an in-line bale wrapper, feed enough animals that at least one bale is fed per day. This is because as a bale is fed, the next bale is being exposed to air. Individually wrapped bales are usually not subject to exposure before they are fed, thus the feeding schedule is somewhat more flexible. • Store bales where plastic integrity can be maintained. Keep bales away from trees where limbs may fall. Also keep weed growth under control, but don't place bales on freshly mowed areas where coarse stubble can puncture the plastic wrap. Check the area for rodent activity. • Harvest forage at 50 to 65 percent moisture before it is wrapped and ensiled. Baling too dry is the most common problem. Dry forage doesn’t provide the bacteria enough moisture to allow sufficient fermentation; it does allow fungi to grow during storage and feeding. Baling too wet is a less frequent problem, but high-moisture silage spoils quickly when exposed to air and is subject to clostridial fermentation or botulism. • Don’t spear into bales after they have been wrapped. Squeeze carriers or handlers are preferred, but may still stretch, tear, or puncture bales. Any hole in the plastic barrier can lead to small areas or even entire bales that deteriorate. • To feed a bale that has been wrapped using an in-line wrapper, spear into the bale, lift and pull away. The plastic between the speared bale and the next bale will tear away; then cut over the top and peel the plastic off in one large section. To feed an individually wrapped bale, cut a large "X" in the end to be speared and pull back the flaps. Spear the bale, lift and cut across the top and down the other flat side to peel the plastic off in one piece. In both cases, remove the net wrap or twine before feeding the bale. • Wastage and refusal is rarely an issue when feeding baled silage, unless there are too few animals. If silage remains when the time frame for feeding has been exceeded, put out a fresh bale. Forcing animals to eat waste or refused silage will lead to poor performance and/or animal health issues. Determine bale size, which can usually be adjusted on the baler, during the growing season by considering the number of animals and the feed out rate that will be needed. • Depending on many factors, fermentation usually completes within three to six weeks. Feeding bales before fermentation is complete can be done in an emergency, but the partially fermented product will heat excessively and spoil very quickly. 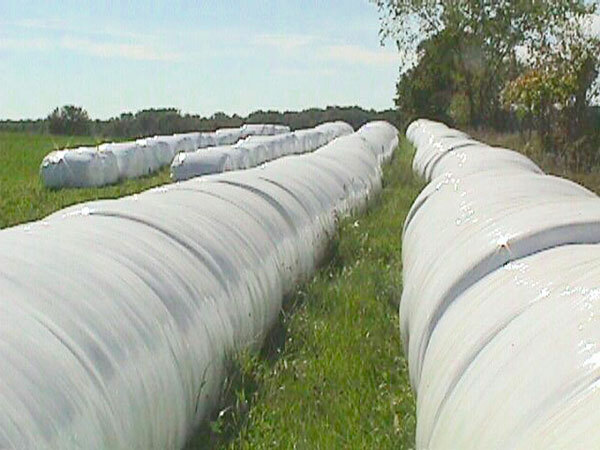 Don't feed bales wrapped with an in-line bale wrapper for at least four to six weeks after wrapping, unless the plan is to feed the whole line of bales in just a few days.